It’s not everyday you get to download millions of dollars worth of free data and analysis. But that’s basically what the UK government’s Ofcom report on International Communications markets is. It covers dozens of markets, but the special Asian focus is Japan and China. No surprise that Japan consistently leads the world in the mobile arena throughout the report.But perhaps more surprising is that China broadband users lead the world in TV clip/programme viewing via the PC. From the data (sorry the chart is blurred) you can see that 70% of all Chinese broadband users had viewed or downloaded TV. 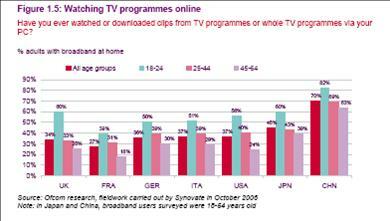 This was FAR ahead of other markets like Japan (just over 40%) and USA (under 40%).The chart also shows a generation divide in China, as across the world, with over 80% of 18-24 year olds having downloaded TV, versus just over 60% of 45-54 year olds. Entry filed under: asian regions, china, japan, media general, mobile, television, trends.